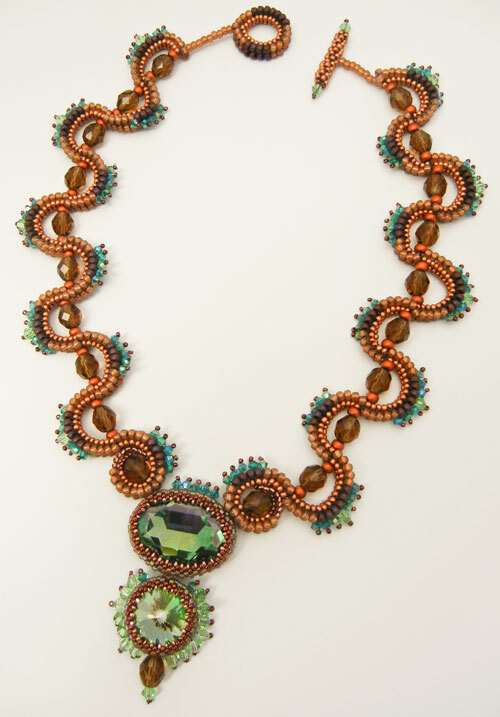 As I was adding the final embellishments to this Sinusoidal Necklace design by Melissa Grakowsky (won’t it just make a Fall wardrobe pop! ), I was thinking that I’d like to take Melissa’s sine-wave shaping and use it in a more casual necklace. And then I was reading Jean Yates’ blog, and saw that Melissa has already done that for me! 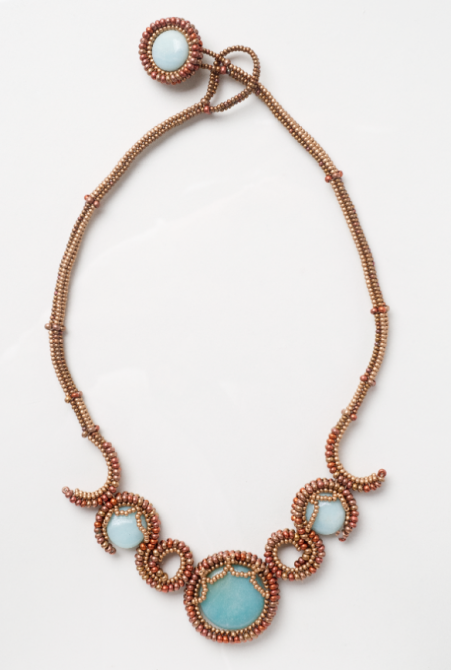 Her new book, I Can Herringbone, is due out in early-November, but Lark has given us two preview projects now, including the Athena necklace. Can’t you just see this with a druzy quartz focal? (There’s a braided bracelet, too.) Click over to Lark and check out the free herringbone designs from Melissa Grakowsky and Mabeline Gidez’s sparkling right-angle-weave . Oooh, yum! Maybe this will be a herringbone weekend for me...thanks for the gorgeous inspiration! Both necklaces are incredibly beautiful.The first one is very decorative and I think-lots of work has been put into it.Fantastic crystals and their bezels,lovely color. The second one,seems to be more simple,but not less elegant.There's still a lot of elegance in simplicity and I think that design would be liked by the Swedish people,as it is very close to the Scandinavian climates. Swervy and Curvy and Gorgeous! What a gorgeous statement piece for fall! Beautiful job!